It’s Mei Lun and Alain’s last day in Blois. The sun is shining brightly even though it’s four degrees. We decide to go into Blois and visit the Cathedral area. We park on the mail, so-called because of a game called mail, from maillet meaning mallet, that was very popular in the Loire Valley. 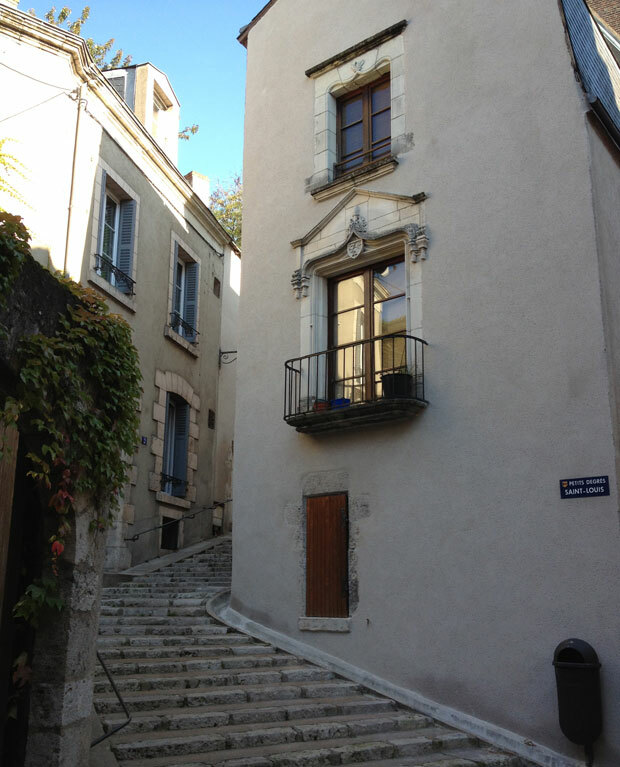 We cross the road and walk up a little street that leads to a set of stairs called petits degrés because they are shallow, as opposed to the steeper grands degrés near the château. We keep going until we come out behind the cathedral. I’m enjoying myself as I’ve never taken this route before. We visit the cathedral , which has had a chequered existence. The original sanctuary, built during the reign of the Merovingians (5th to 8th century), was dedicated to Saint Peter. A second church was built there in the 12th century, this time under the patronage of Saint Solenne. In 1678, “a hurricane forced its way inside and lifted the roof” (I love the translation ! ), destroying the nave. Gothic restorations were carried out between 1680 and 1700 and the new cathedral was dedicated to Saint Louis after Louis XIV presented the church with an organ. Like many of the churches in the area, most of the stained-glass windows were destroyed by American bombs in the Second World War. Chartres was an exception, because all the windows were taken down before the bombing started. A new set of 33 windows, inaugurated in 2000, was designed by the Dutch artist Jan Dibbets and made by the French stained-glass artist, Jean Mauret. We turn right as we walk out the church and past the Town Hall. Just opposite is a beautiful, though inaccurate, sun dial, which reminds me that I need to go to Italy again to find one for Closerie Falaiseau! 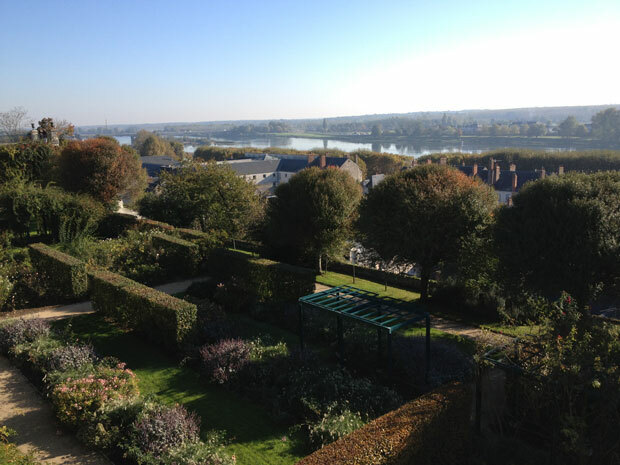 We continue walking until we come out on the terrace overlooking the Loire. The last time I came here, it was freezing cold and difficult to really appreciate the wide-sweeping view. 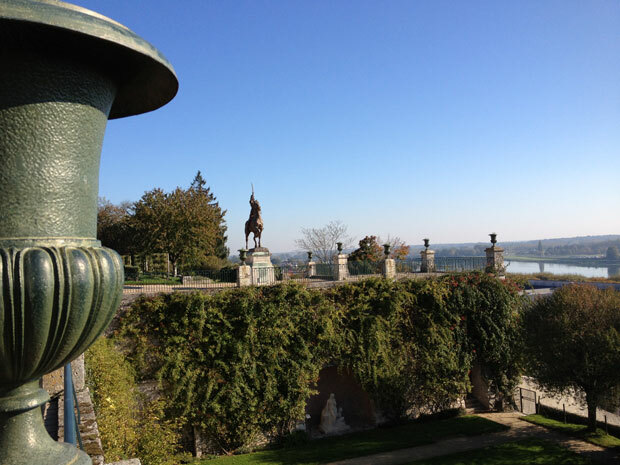 The large urns remind me of my balcony in Paris. We go back in the other direction and wander down the hill until we come to the Denis Papin steps. At the bottom we turn right and keep following the little streets in the general direction of the château, eventually arriving at Place Louis XII. 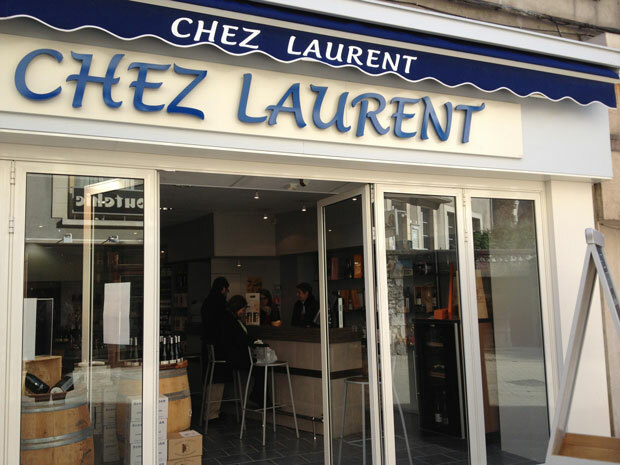 Alain is keen to find some vouvray moelleux and has noticed a wine shop called Chez Laurent on one side of the Place. As we walk in, who do I see? 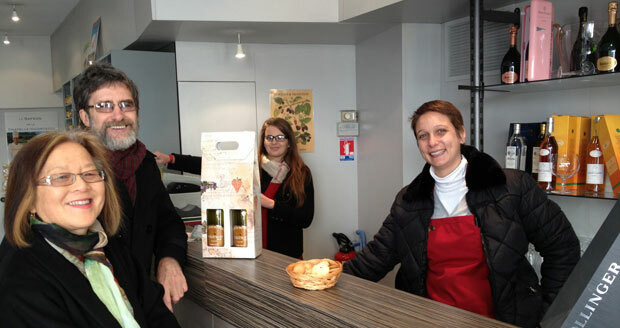 Virginie, the sommelier, from Vinomania, with whom Kathy Standford and I did our wine tasting in June. I knew that she was going to another location because she wanted to be more involved in the wine-buying and tasting process, but hadn’t been able to locate her. She welcomes us in and although she doesn’t have the wine Alain is looking for, she suggests we try two other vouvrays. We prefer the 2005 tendre from Domaine du Viking so Alain buys a couple that she puts in an attractive carry box. They’re only sorry they won’t have time to have a Loire Valley wine historical tasting – it’s a good incentive for next time. 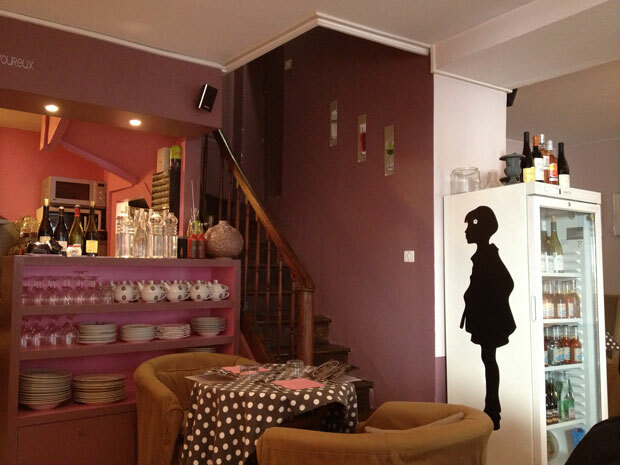 Our last stop is L’Appart’thé, where Mei Lun and Alain want to sample a café/thé gourmand, as I’ve told them it’s one of the best in Blois. We ask if we can just have a tea or coffee, but the owner explains that it’s lunch time, so we decide to have an early lunch. Alain and I have the goat’s cheese and zucchini tart while Mei Lun has the spinach and salmon. Both are delicious. 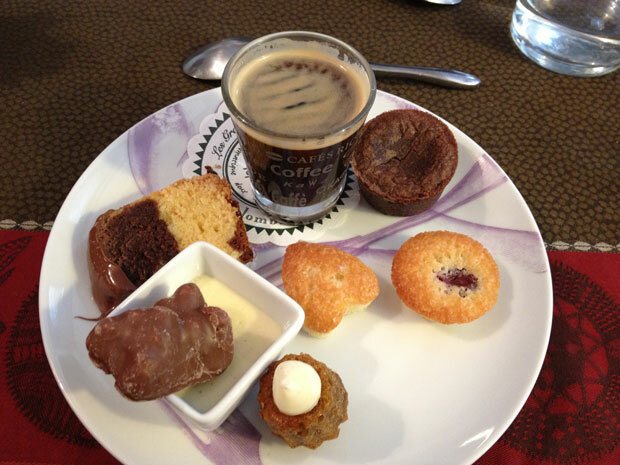 The thé/café gourmand lives up to expectations with a lovely selection of baked goods, including a mini cannelé, a moelleux au chocolat, a panna cotta and a chocolate and vanilla sponge cake. In the car on the way home, we all agree that Blois is a great place to live! 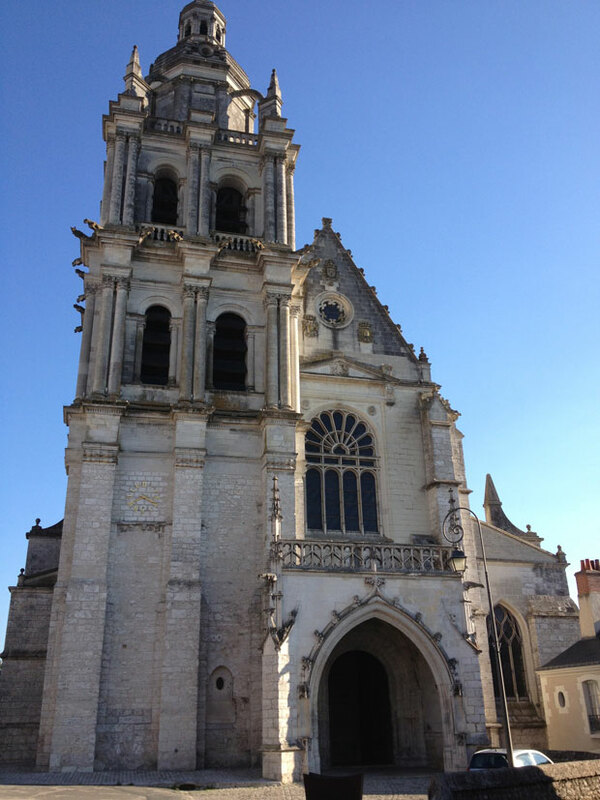 This entry was posted in Architecture, France, Loire Valley, Sightseeing, Wine and tagged Blois, Chez Laurent, l'appartthé, Saint Louis' cathedral, wine tasting. Bookmark the permalink. I am so pleased that you have been able to find Virginie again. The winetasting we did with her was not only very informative but lots of fun. I must get up to the Cathedral next time I stay at Closerie Falaiseau so that I can see that amazing few. I have been told that Tours cathedral stained glass windows were saved in the same way and rival Chartres in quality and completeness. One of Tours best kept secrets I think. Too late now for your friends, but for future visits of Vouvray moelleux lovers, I can highly recommend the Chateau Gaudrelle Réserve Speciale. I took a bottle to a friend only the other day. I’ll introduce you to the team at Chateau Gaudrelle one day if you like. Yes, I’ve seen the Tours Cathedral, and the stained glass windows are very beautiful. However, Chartres is one of my favourites, not only for its glorious blue, but also for its other features, particularly its fabulous carved choir screen. I also am the very proud owner of a small lead-light window containing a blue cabochon from one of the stained-glass windows in Chartres cathedral which the previous owner bought when some of the windows were taken down for renovation! Thank you for the offer to introduce me to the team at Chateau Gaudrelle. I should love to meet them.